Studying benthic infauna from the tropics to the poles! One of the most sensitive, best understood, and relevant indicators of estuarine ecosystem condition is the benthic infaunal assemblage. With funding from SIMoN, the Benthic Lab has collected data from intertidal and subtidal sites along the main channel of Elkhorn Slough. These data are key for examining community changes since the last major sampling effort in the 1970s, and thus for investigating effects of erosion in these fully tidal sites. 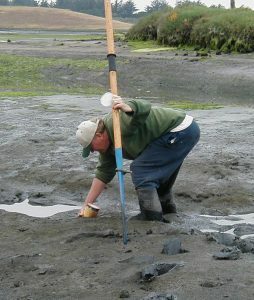 With the support of the Elkhorn Slough Foundation and the Elkhorn Slough National Estuarine Research Reserve, the Benthic Lab has also collected data from tidally restricted wetlands in the Elkhorn Slough watershed (South Marsh, North Marsh, Whistlestop Lagoon, Pick N Pull Marsh, Azevedo Ponds, Porter Marsh, Moro Cojo Slough, Bennett Slough). Analyses revealed differences in intertidal and subtidal communities, as well as differences in communities from tidally restricted wetlands along a gradient from very restricted to fully tidal.